In this method of welding, an electric are is formed between the tip of a metal rod and the metal being joined. The intense heat created by the arc causes the metal to melt and fuse. The high current necessary to pro­duce the arc is supplied by a transformer. The output of this transformer can be varied to increase or decrease the inten­sity (power) of the arc, which means that this welding technique can be used on a range of material thicknesses. Small welding transformers are readily avail­able which will operate from a 13-amp socket. The output current controls on trans­formers may be either stepped or step-less. A stepped control has a series of fixed outputs which can be selected indi­vidually. The main disadvantage of this system is that one point may not be quite powerful enough and the next incremen­tal point may be too powerful. This is particularly a problem at low powers when welding thin sheet. By contrast, a stepless control can be set anywhere between the minimum and maximum power of the transformer, so it is easier to select the correct power when weld­ing thin materials. Stepless transformers tend to be more expensive than stepped ones. A welding transformer comes with two heavy-duty cables. One cable is the earth return and this should be clamped to the job. All parts of the job must be electri­cally in contact with this cable. The other cable is attached to an electrode holder which you hold in your hand. A flux-coated metal rod of suitable size is clamped in this holder. 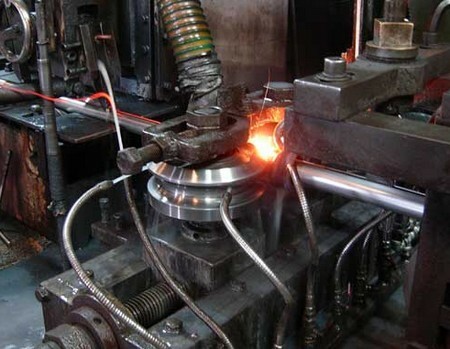 Start the welding process by striking an arc between the tip of the electrode and the job. This is done by lightly scraping the tip of the electrode across the job until an arc is made. Then guide the tip of the electrode along the joint at a suitable speed. The heat generated by the arc will melt the metal on either side of the joint and will also melt the electrode which will then flow into and fill the joint. The electrode has a flux coating, and this will also melt and form a shield between the joint and the atmosphere. When the joint is cool, the flux adhering to the outside of the joint should be chipped away with a hammer. If the electrode is moved along the joint too quickly, the joint will not have sufficient time to heat up and melt, and a weak joint will result. If the electrode is moved along the joint too slowly, too much of the metal around the joint will be melted and holes may appear. This will also happen if too high a power is selec­ted. But if too low a power is selected, the arc will be difficult to strike. The electric are emits intense ultra­violet radiation which can damage skin and eyes. Anyone using an electric are welder and anyone nearby must wear a very darkly tinted screen to view the arc one conforming to the appropriate British Standard (BS679). 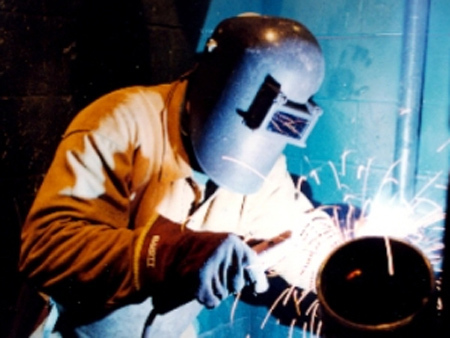 The fumes from the molten flux can be harmful do not weld in a confined space. Sparks or hot slag from the weld can cause a fire.